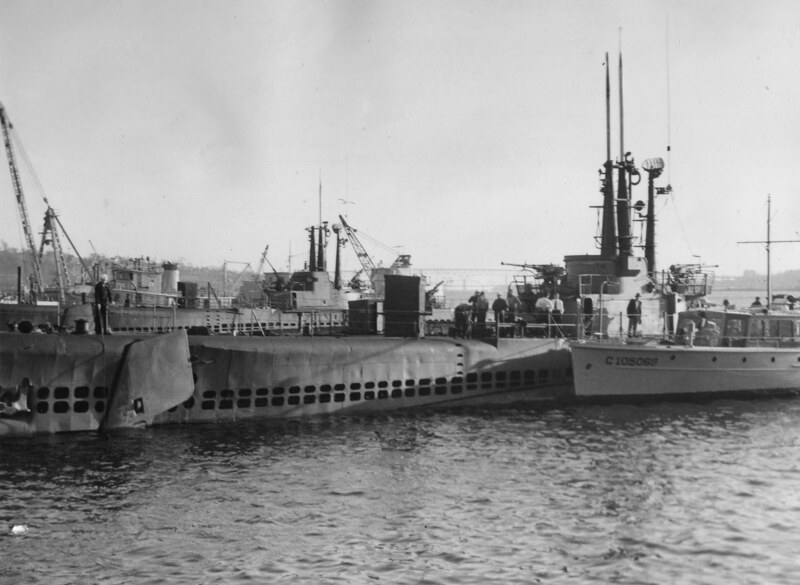 Balao Class Submarine: Laid down, 7 February 1944, at Portsmouth Navy Yard, Portsmouth, N.H.; Launched, 7 May 1944; Commissioned USS Sea Owl (SS-405), 17 July 1944; Converted to a Fleet Snorkel Submarine at Philadelphia Navy Yard from April to August 1951; Redesignated Auxiliary Research Submarine (AGSS-405), 30 June 1969; Decommissioned, and Struck from the Naval Register, 15 November 1969; Final Disposition, sold for scrapping, 3 June 1971 to Universal Machine Co., Newton Center, MA for $ 81,613.00. Scrapped by American Marine Salvage Co., Bordentown, NJ. 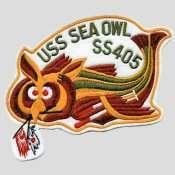 Sea Owl earned five battle stars during WWII. 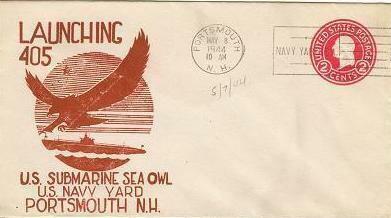 16k Commemorative postal cover on the occasion of the launching of the Sea Owl (SS-405), at Portsmouth Navy Yard, Portsmouth, N.H., 7 May 1944. Courtesy of Jack Treutle (of blessed memory). 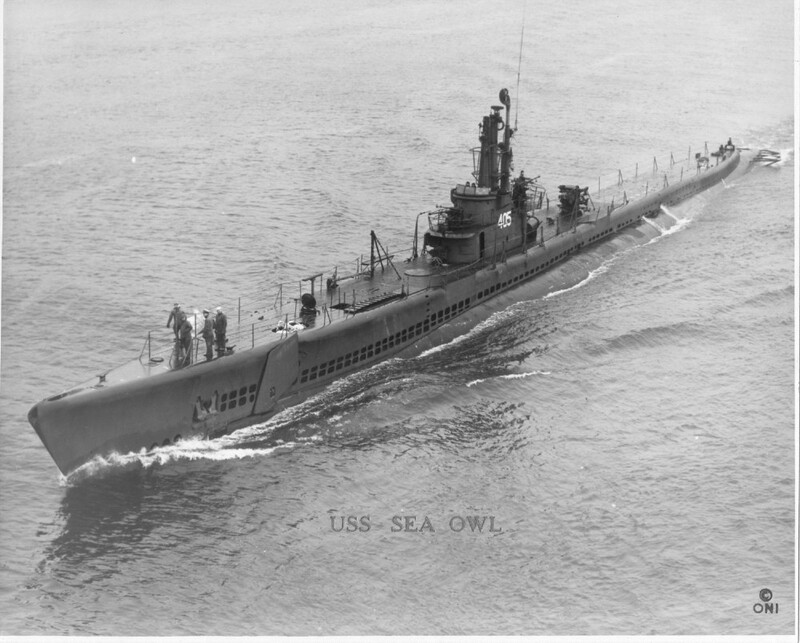 102k Sea Owl (SS-405) was sponsored by Mrs. Thomas L. Gatch. Her husband, Rear Admiral Thomas L. Gatch was one time CO of the battleship South Dakota (BB-57) and also 16th JAG, 1943-45, of the USN. He stands to the right. Photo courtesy of Dale Hargrave. 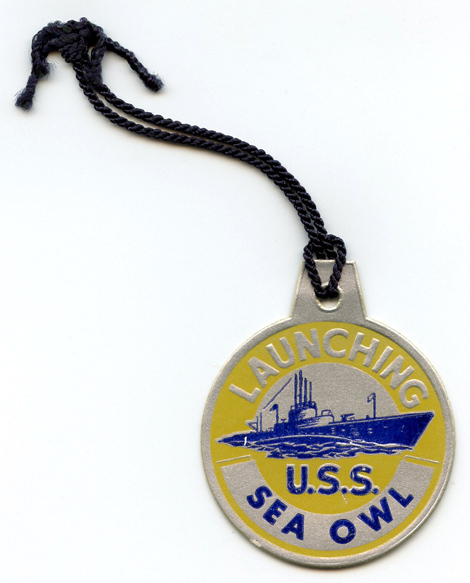 147k Commemorative launch tag on the occasion of Sea Owl's (SS-405) launch at Portsmouth Navy Yard, Portsmouth, N.H., 7 May 1944. Photo courtesy of Bill Gonyo. 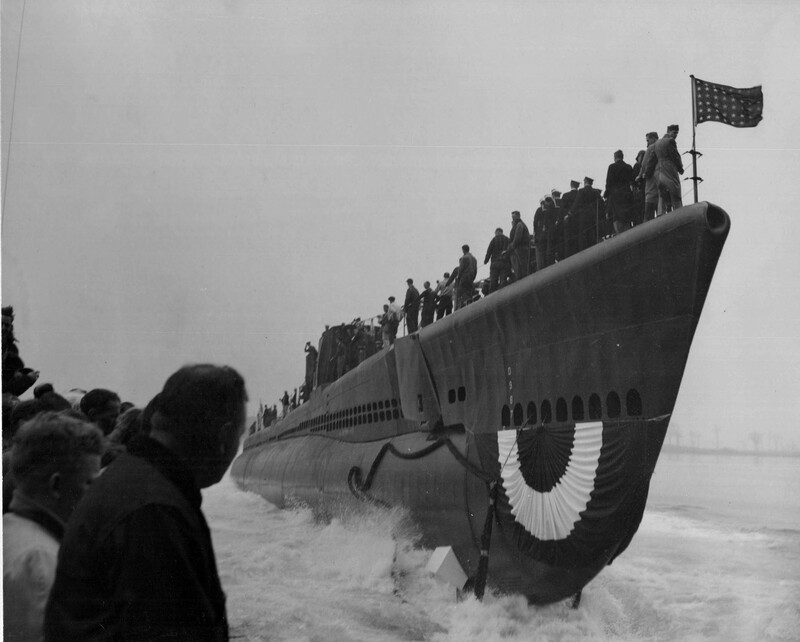 488k You can almost hear the waves rush as the Sea Owl (SS-405) slides into the sea on 7 May 1944. USN photo # 80-G-448573 from National Archives and Records Administration (NARA), College Park, Maryland, courtesy of Sean Hert. Boat #1 is a 2/1/1 EB Balao. 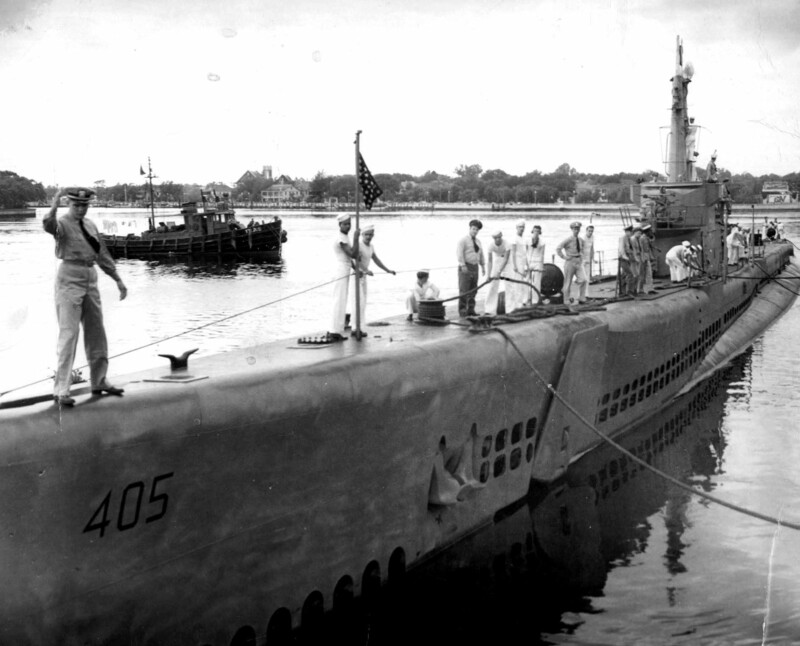 It can't be a Tench class because the only EB Tench was Corsair (SS-435), and she was a 1/3 configuration. The third thick mast is not on this boat. The aft gun deck does have a brace that runs down to the main deck and this indicates a later production boat. Boat #2 is a Mod 3 EB Gato. She could be the Barb (SS-220). She received her SV mast and 40s fore and aft, plus a five incher aft in her final wartime refit. She never received the full covered wagon cut down. Plus. she would have had a full length wooden deck as built. Boat #3 is a 2/1-1 Government Balao or Tench. Notice the temporary exercise identification number 22 on the side of the fairwater. I am leaning towards a Tench due to the ladder leading down to the main deck from the aft gun deck. 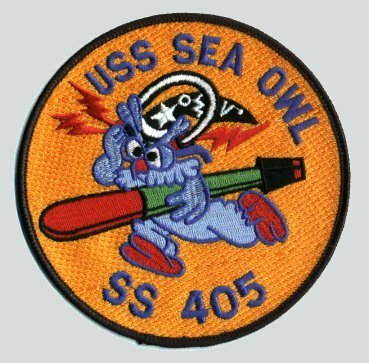 Boat #4 is the Sea Owl (SS-405). The giveaway is the box like sponsons on either side of the bridge that held Target Bearing Transmitters (TBT's). She was the only Balao/Tench to have this feature. On this date she still sports her original 2/1/1 mast arrangement. 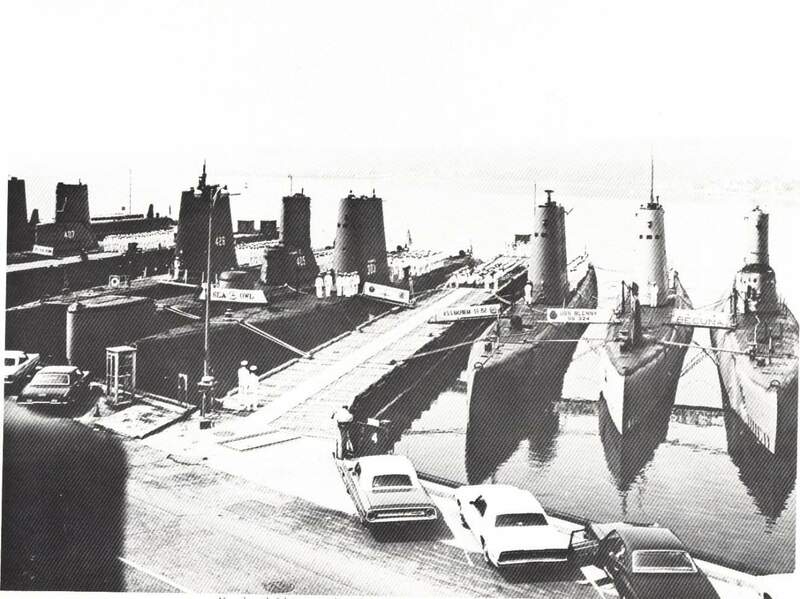 Later post war photos show that she was converted to a 2/1-1 configuration. Boat #5 is a total unknown. There isn't enough visible to make any informed guesses. Text courtesy of Dave Johnston(USNR) & Robert Morgan. Photo courtesy of Robert Morgan. 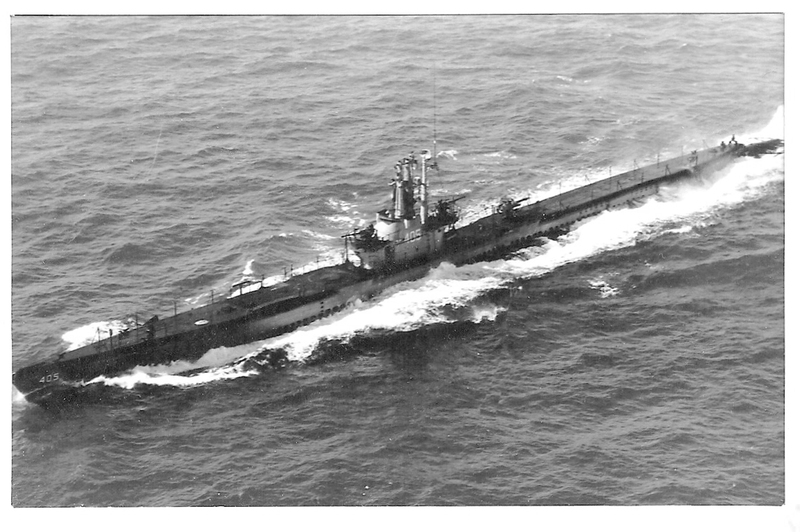 847k Sea Owl (SS-405) early in her career during the war. Text courtesy of DANFS. Photo i.d. courtesy of John Hummel, USN (Retired). US National Archives photo # 80G 282832 from NARA, College Park, Maryland, courtesy of Sean Hert. 191k New London, Connecticut 1949. The Balao class boat in the foreground is the Sea Owl (SS-405). What gave it away were the box-like sponsons on either side of her bridge. 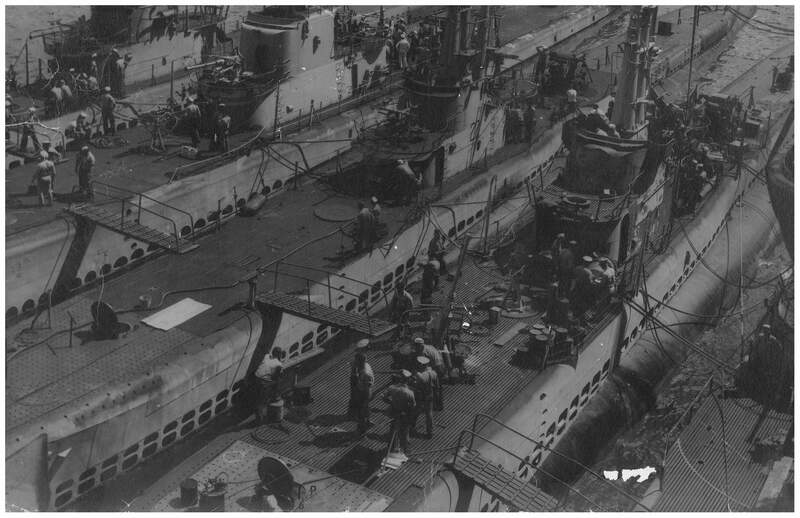 These were very rare additions and I have only seen them on a shot of the Gato class Bashaw (SS-241). They were used to mount the Target Bearing Transmitters (TBT's), which were normally mounted in forward (bridge) and aft (cigarette deck) positions. In addition, the configuration of the wind venturi on the forward edge of the bridge varied greatly from boat to boat and in this case it matched the other Sea Owl photo. 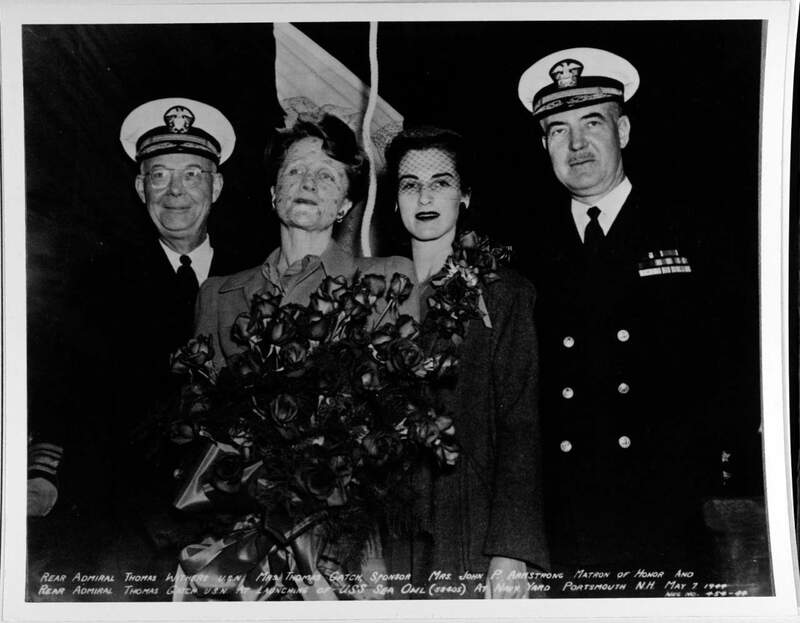 Information located in the Sea Owl entry in the Dictionary of American Naval Fighting Ships shows that she was operating out of New London in the fall of 1949, and that was the clincher. The boat in the background is also a government built Balao/Tench class but unfortunately it doesn't have any outstanding distinguishing features that might give it away. USN photo courtesy of Seattle NARA & submitted by Tracy White. Photo i.d. courtesy of David Johnston. 182k In her original configuration in this January - March 1951 photo, the Sea Owl (SS-405) sports one 5"/25 deck gun, two 40mm gun mounts, two .50 cal. machine guns. USN photo courtesy of John Hummel, USN (Retired). 268k The crew is all decked out for the Sea Owl's (SS-405) return, early 1950-51. Photo courtesy of John Hummel, USN (Retired). 723k Sea Owl (SS-405) circa early 1950's. Photo courtesy of former S1/C (SS) Bill Tebo, who was a crew member of the Sea Owl from 1944 - 1945 & submitted by Arnold Putnam. 228k Sea Owl (SS-405) 7 July 1952. USN photo #USN 447520, courtesy of Scott Koen & ussnewyork.com. The rest of the subs are too far away for positive identification. Text courtesy of David Johnston. Photo i.d. courtesy of Mike Brood. USN photo courtesy of Submarine Force Library, courtesy of Ken Hart. 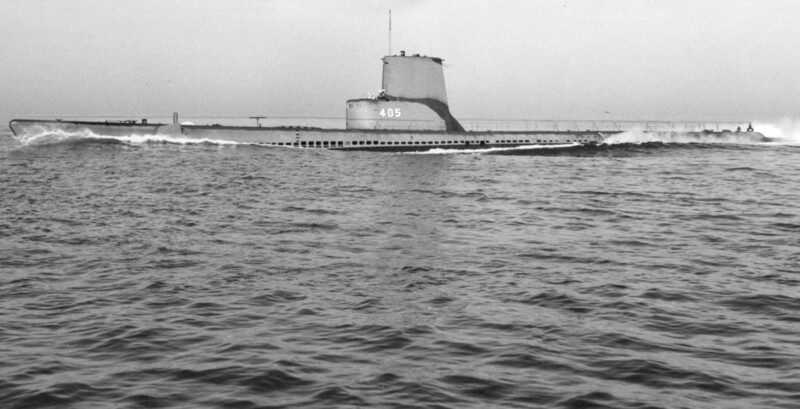 118k Sea Owl (SS-405), circa 1956. 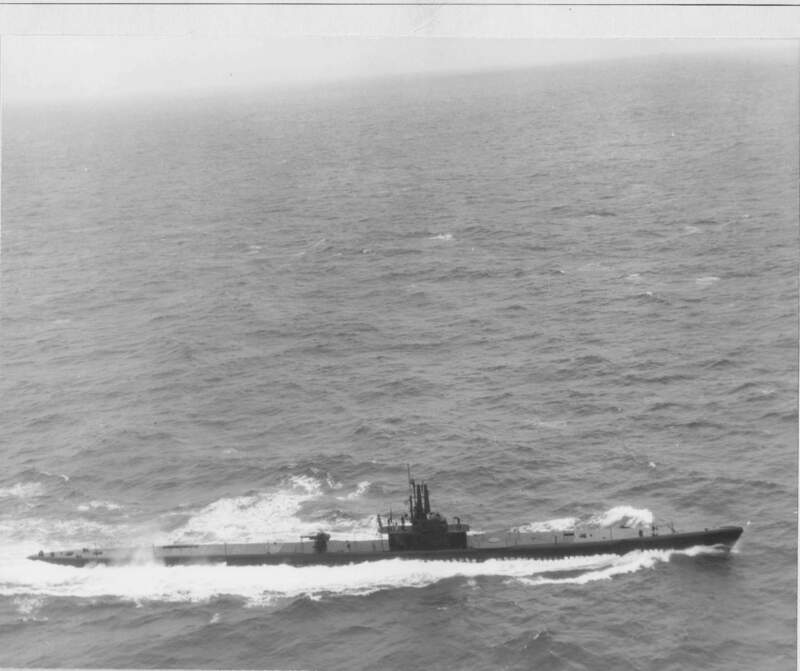 After engaging in special operations in the late fall of 1956 and early 1957, the submarine resumed normal duties in the New London area until 1 September when she departed to engage in NATO exercises "Fishplay" and "Strikeback" in the northern Atlantic, returning to New London in October. Text courtesy of DANFS. 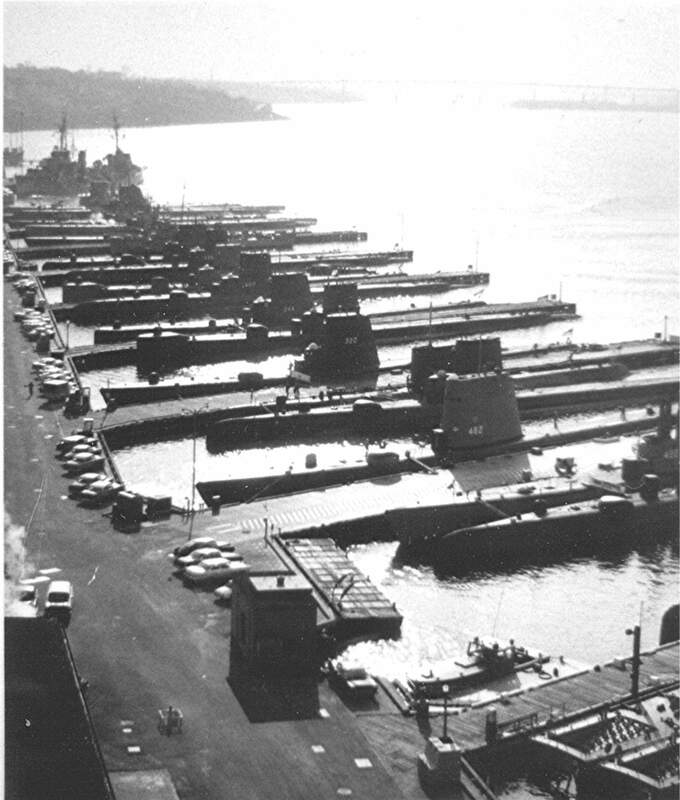 USN photo from Jane's Fighting Ships, 1956-57 submitted by Robert Hurst. 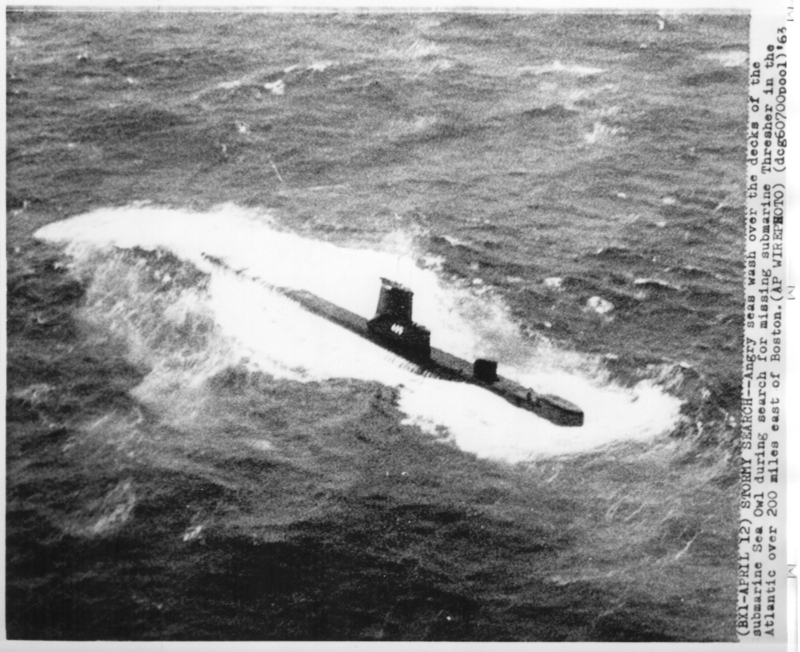 434k Sea Owl (SS-405), as seen from CDR Thomas B. Ray's window while flying ASW from the deck of the Essex CV-9). From the collection of CDR Thomas B. Ray, Essex CV-9) via Fred Willshaw & Chris Stanley. 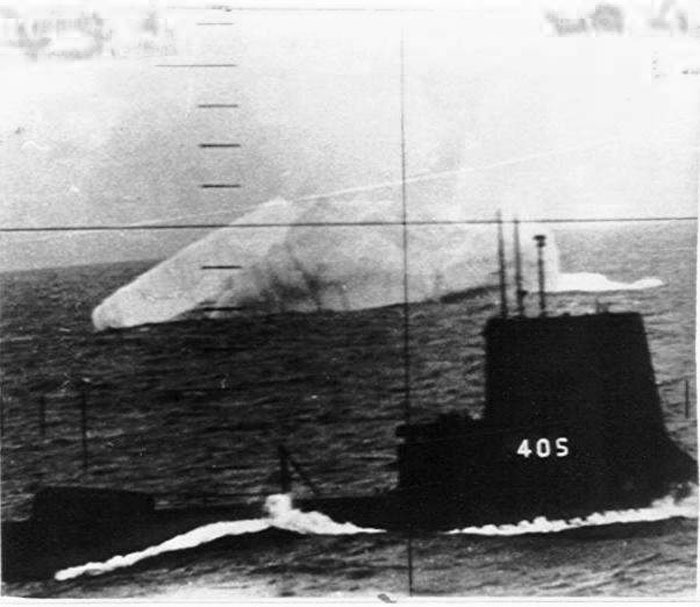 107k Sea Owl (SS-405) & Becuna (SS-319) at Genoa, Italy, 11 February 1962. Photo courtesy of Carlo Martinelli. 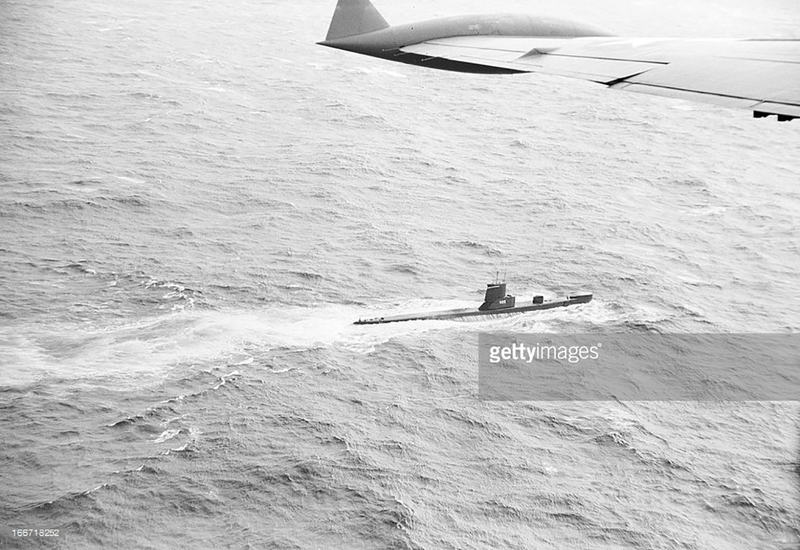 692k Seen from a Navy search plane, the submarine Sea Owl (SS-405) conducts a search for the sunken nuclear sub Thresher (SSN-593), 11 March 1963. Photo by Pictorial Parade/Getty Images, courtesy of gettyimages.com. Insert photo by Paul Slade/Paris Match via Getty Images, courtesy of gettyimages.com. 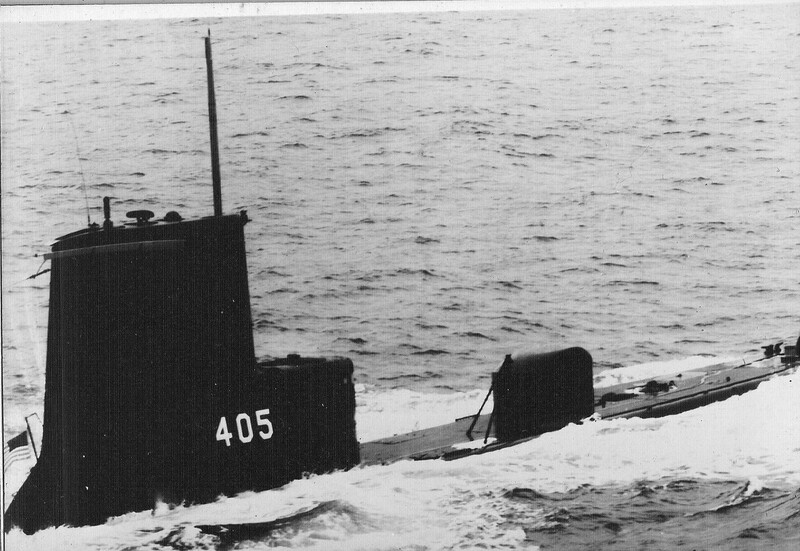 107k Sea Owl (SS-405), 1965 fitted with BQR-4A sonar same as SSK conversion, but was never re-designated SSK. Photo taken at Halifax, N.S. 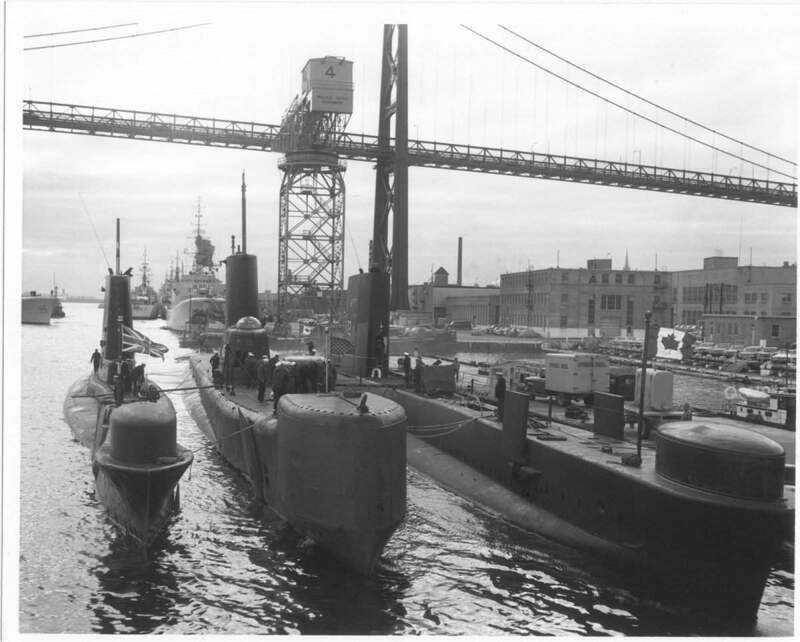 between British A class and British built Canadian Oberon class & HMCS Ojibwa. Royal Canadian Navy photo courtesy of John Hummel, USN (Retired). 86k Sea Owl (SS-405) photo taken May 1967. Sea Owl boarded a Prospective Commanding Officers' class for a training run between New London and Holy Loch, Scotland. Passing an iceberg here. LCDR Herb Charier commanded at the time. USN photo courtesy of Don Ulmer. 49k From left to right, Sea Robin (SS-407), Tusk (SS-426), Sea Owl(SS-405), Sablefish (SS-303) ,Halfbeak (SS-352), Blenny (SS-324) & Becuna (SS-319) at New London CT., in 1968 during change of command. Courtesy of John Hummel, USN (Retired). 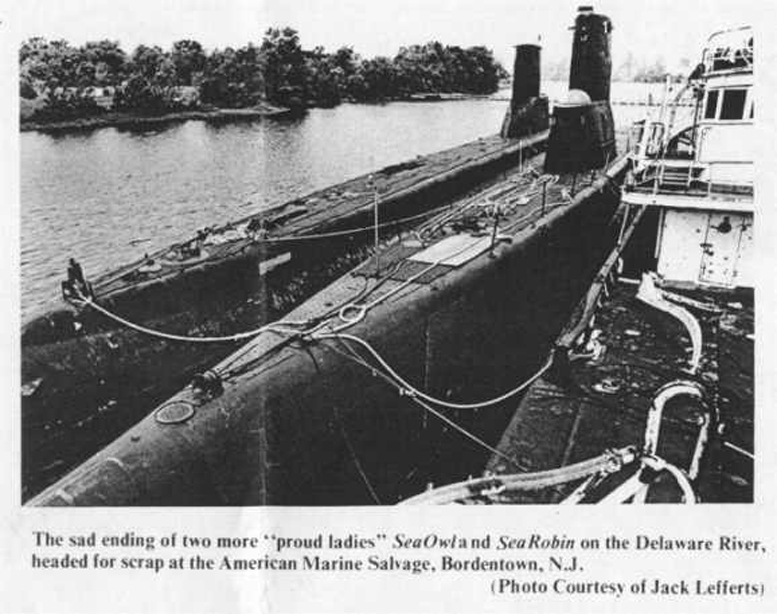 250k The sad ending of two more proud ladies Sea Owl (SS-405) & Sea Robin (SS-407) on the Delaware River, headed for scrap at the American Marine Salvage, Bordentown, N.J. Photo courtesy of Jack Lefferts via ss-407.net. 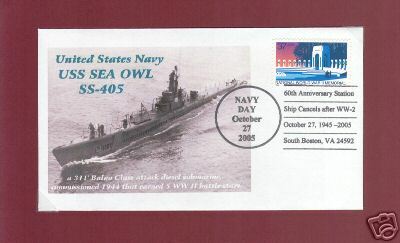 16k Commemorative postal cover on the occasion of 60th year anniversary of the Sea Owl's (AGSS-405) service on Navy Day, 27 October 2005. Courtesy of Jack Treutle (of blessed memory).